This is the nineteenth time we’ve done this. And guess what? I’m not sure we’ve gotten it right yet. That is because the audience, the venue, the demos all change. We change, we adapt, we admit our failures and most importantly we try to improve. We are moving venues. First and foremost, DemoCamp is a social gathering. The goal is to bring together designers, developers, entrepreneurs and marketers for cocktails over technology demos. DemoCamp Toronto 19 is happening March 3, 2009 at The Imperial Pub. Student – Attendees must be registered full-time in an academic program. Early-bird – Essentially the same as a regular ticket. Regular – Access to demos. Limited to 80 people. Sponsor – Logos on the web, PowerPoint, etc. Plus access for 2 spaces to demos. Networking Only – NO access to demos. We are trying to improve on the boondoggle that was perceived as paid seating at DemoCamp Toronto 18. Just because you’ve purchased a ticket, does not guarantee you a seat. We’re limiting access to the venue and we will try to improve on the experience for those in attendance. We are looking for presenters. We are looking for people with interesting stories about building software, solving problems, building businesses. The goal is to celebrate all of the great things that community members have been working on. As a presenter, you get the attention of the audience for 5 minutes. We try to curate a great set of presentations. The audience lives and breathes new technologies and emerging companies. Just because you’ve built something doesn’t mean anyone else will care. If you think you’ve got a great story to tell, drop me a note, or submit a presentation at Strutta. We will be selected 2-3 of the best presentations to be included at Interactive Ontario’s Interactive Exchange IN09 happening March 17-19, 2009 at The Carlu. 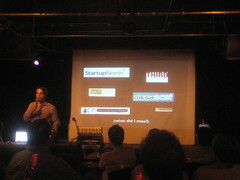 The “winners” will one complimentary registrations at IN09 and the opportunity to present during the DemoCamp session. We also have a complimentary registration to MeshU. I’m a huge fan of MeshU, and I’m I’m thinking the goal will be to give the registration to a start-up or student. This entry was posted in DemoCampToronto19, Toronto and tagged democamp, DemoCampToronto19, Toronto on February 19, 2009 by davidcrow.